“The Solomon Exam Prep Guide to the Series 51” offers a comprehensive guide to the MSRB Series 51 Municipal Fund Securities Limited Principal Qualification Examination. 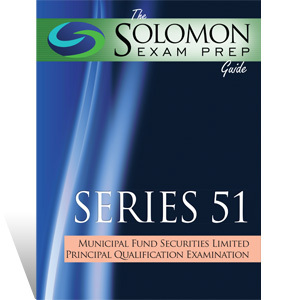 Written in clear English and offering practice questions with detailed explanations, stimulating exercises, and visual aids sprinkled throughout the text, the Solomon Exam Prep Guide will get you on track to passing the Series 51 Municipal Fund Securities Limited Principal exam. What does a Series 51 license allow me to do? • training of principals or representatives. How long should I prepare for the Series 51 exam? 70% (Please Note: Your score will be rounded down to the lowest whole number (e.g. 69.9% would be a final score of 69%--not a passing score for the Series 51 Exam). What subjects does the Series 51 exam test? Are there other FINRA exams I need to complete as a prerequisite to attempting the Series 51? A candidate must also have previously or concurrently qualified as a general securities principal (Series 24) or investment company/variable contracts limited principal (Series 26). The cost of the exam is $255 at this writing. If I stop working for my firm, how long will my Series 51 license remain active? When you cease working for a firm, your employer will file a Form U5 to terminate your registration. Your next employer will file a Form U4, which will re-register you. As long as you do not exceed two years between employers, your Series 51 license will remain active. Many thanks to the fine staff at Solomon Exam Prep. I'm happy to report that I passed the Series 50 Municipal Advisor exam on my first attempt. The written material is extremely thorough and comprehensive. With respect to the online quizzes and final exams, the questions are very comparable in difficulty to the actual exam, thus providing the foundation for success. A special word of thanks to Carson for his encouragement and support. I passed the Series 82 with the help of Solomon and I am more than happy to put myself in their hands to help me pass 24 and 79 still ahead of me. The materials were excellent and the staff was very responsive and helpful. Highest recommendation!